Here are some facts about the River Niger. 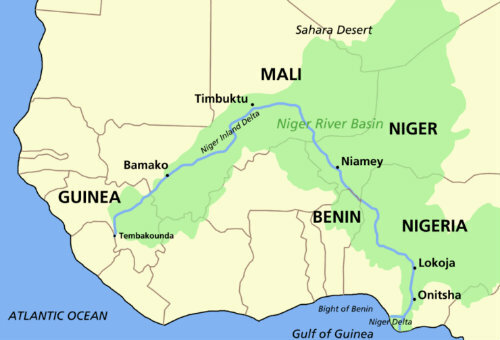 The Niger River is Africa’s third longest (after the Nile and the Congo) with a length of 2,600 miles. It flows from its source in Guinea to its mouth at the Gulf of Guinea. The Niger River has one of the most unusual courses of any major river. Although its source is only 150 miles inland, it flows away from the sea towards the Sahara Desert before making a sharp right turn towards the sea. The huge Niger delta covers an area of about 14,000 square miles, and is made up of many small channels. The delta stretches for about 200 miles along the coast. The Niger River was not fully explored by Europeans until the late 18th century. Mungo Park, a Scottish explorer, sailed 1,500 miles down the river, but drowned in some rapids while fleeing hostile native tribesmen. The Niger passes within a few miles of Timbuktu, one of the remotest cities in the world. The town is home to several historic mosques and ancient manuscripts. The river is home to the West African Manatee (sea cow), which can reach a length of 15 feet. About 250 species of fish can be found in the Niger, and some of them can’t be found anywhere else in the world. The Niger River gives its name to the countries of Niger and Nigeria. The river’s name probably comes from the Latin for black. The Niger’s headwaters are in very old rocks that contain little silt. Because of this, the river carries very little sediment. The Nile is carries ten times more sediment than the Niger. The Niger is an important source of water to over 20 local tribes. Many still collect water in traditional bowls made of animal skin. What next? Find out about some other important rivers by visiting our rivers resources page.